Despite an evolving MMO marketplace, World of Warcraft is sticking to its subscription blunderbusses. If there's been any major change to the MMO genre in the past few years it's been the adoption of the free-to-play business model. Not only are countless new MMOs using the micro-transaction pay scheme from the get-go, but some of the big boy contenders that started with subscriptions have even converted after launch; Games like DC Universe Online, Age of Conan, and Star Trek Online have all stopped asking their players to mail in a check every month. 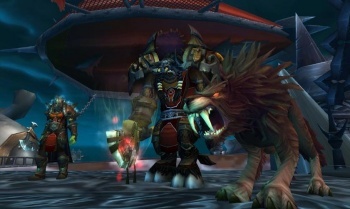 According to Blizzard president Mike Morhaime, World of Warcraft won't be quite as quick to jump on the bandwagon. "I think that there's an underlying, a fundamental, assumption right now that the less you charge, the more money you make ... which isn't true. And it doesn't necessarily make for a better game," Morhaime said. "I mean, everybody likes free... I think that definitely, players have seen a lot of really great quality free-to-play experiences, but I'm not sure it's the best model for us right now." WoW has seen a slow but steady decline in its subscription numbers for the past year, but Morhaime refuses to give into external game analyst predictions that WoW may be forced to adopt the free model at some point soon. According to him, quality is king, and WoW is synonymous with quality. "For us, and even for EA with the Star Wars game, I think that the value that you get for the $15 a month is just unmatched," he said. "I don't think you can get that amount of entertainment value anywhere. I'd put the $15 up against anything. "Definitely, if you're not charging anybody, [players] are going to be a lot more forgiving about the experience they have. They haven't paid anything. So in terms of developers entering the market, I can understand why a lot of games might choose to go free-to-play." Zing! It almost sounds like Morhaime is implying that free-to-play games only use the model to get away with offering lower quality content. Still, many games (such as the upcoming MMO, FireFall) are pushing the limits what we've come to expect from free-to-play titles. If they can match WoW's quality pixel for pixel, Morhaime might have to reconsider his argument. In lieu of changing its price, WoW has been trying some other ideas to keep the game on top, such as a new expansion featuring the long-clamored-for Pandaren race, and offering promotions aimed at rewarding loyal players with major bonuses like free copies of upcoming Diablo 3. Regardless of the game's recent "decline," love it or hate it, WoW is still on top by a long shot, and they didn't get there by not understanding the marketplace.